“Ted” Baldwin was variously described as a carpenter, joiner and coach builder. It is known that he was employed at the Farmers Foundry when they lived in Great Ryburgh working in the carpenters shop where he would have been responsible for many of the wooden parts of wagons, tumbrils, threshing machines, elevators and other Foundry products. Fred Baldwin was the eldest of their 4 children, the others being Sidney Percy b .4 July 1896, Winifred Louisa b. 13 April 1901 and Olive Mary b.1907. This information is found in the new School Register which started after Fred was enrolled at the school and so his name is not to be found there. Curiously, Sidney, who is No 3 in th new Register, has the word "dead" pencilled in the margin, something which Albert Foster did on just the first page for just some of those former pupils who had died. It is most unfortunate he confused the two brothers! According to the 1911 Census when all the family are living "near to the Bakehouse", he is listed as being a domestic coachman and his brother Sidney a domestic page-boy. 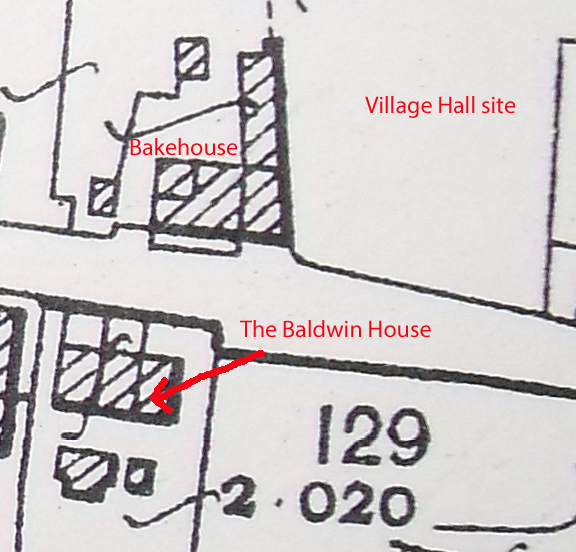 The house is the first of the terrace, almost opposite the Village Hall and next to the entrance to the Playing Field, neither of which were in existence at that time. Where they were employed we can not be sure…… but there are not that many houses within close proximity that would have offered those employment prospects. From the surviving Medal Index Cards, we can learn that Sidney enlisted and first saw service in France on July 18th 1915. 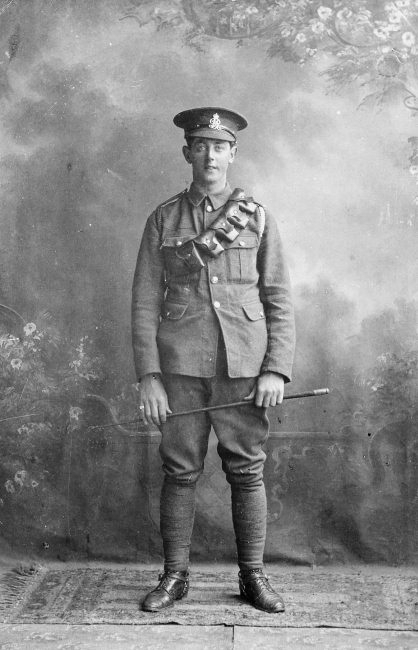 Fredrick, it is believed, enlisted with the Norfolk Yeomanry as Pte. 2595 in October 1915. He later transferred to the Northamptonshire Regiment with a new number, 43307. Sidney Percy survived the war, enlisting in the North Staffordshire Regiment and serving in the Labour Corps, to be discharged on 10th. October 1918. "Of the wounded and sick we have good news I am glad to say, though I, with others are truly sorry for the great anxiety of Mr. and Mrs. Baldwin about Fred. So far we can get no further news than he was wounded and taken to Hospital. We were glad to see Sidney [Baldwin] home at last and that he seemed on the whole so well." Fred however was “presumed dead on or since 9.9.16.” according to his entry in the Register of Soldiers’ Effects. A War Gratuity and his back-pay, in total £5-12-5d., were sent to his father in 1919. He was awarded the British War and Victory Medals. As his body was never identified, his name is inscribed with so many others on Pier 11 A and Face 11 D.of the Thiepval Memorial on the Somme. “Battn. Under orders to move up to HIGH Wood-but considerable delay owing to 3rd.Bgde. requiring trenches for organizing a fresh attack, refilling dumps etc. Our own stores had also to be re-established 11? Lancs. found carrying party of 200 for this purpose- who entered ELGIN Trench at 12noon. Coys. Begin to move up ELGIN Trench. “D” Coy. Leading and taking over left of Battn. Front, meeting right of 3nd Munsters at Sap4. “B” Coy. Following “D” took over the right of the line in the wood. Front line Coys. Only got into position about 3.p.m. while “C” the support Coy was utterly blocked in the trenches and was unable to get into position until after 6.p.m. when the attack was over. “A” Coy in reserve, managed to force its way thro’ the crowd into BLACK WATCH Trench during the evening. B and D Coys. attacked from the right edge of the Wood to Sap 4. A crater being blown on the right, on the site of the crater blown for the 1st. Bgde. Attack on 3rd. inst. First taken by Black Watch and then lost. No artillery preparation within the wood, but a short Stokes mortar bombardment, which was ineffective, for the instant our men went over the parapet, the Germans opened a very heavy rifle and MG fire. Our attack was unable to reach their objective except on the right, where the crater, (the debris of which injured several of our men) was occupied by 2/Lt. Clarke and his platoon. This platoon was supported by another under 2/Lieut. Cooper and a Lewis Gun. The Germans counter-attacked strongly with bombs, put the Lewis Gun out of action, and drove out our men. 2/Lieuts A.H.G.Clarke and D.K. Cooper were missing (the former known to be wounded)- The majority of these 2 platoons were killed, wounded or missing. The 3 other? platoons of B Coy. on the left of the above was also hard hit, 2/Lieut. H.G.Manning being badly wounded. D Coy. on the left of B met with no better success, but more men got back. 2/Lieut. N.G. Jackson killed. Of whom Fred Baldwin was one!